At the end of baby storytime we always have playtime. It is an integral part to any baby storytime, in my opinion. Usually I just put out a bin of toys (you can see what my storytimes typically look like here and here) but after a Twitter conversation between Abby, Rebecca, Mel, Lalitha, Brooke, Jbrary, Kelly, and others, I just had to start doing more. Plus, Rebecca started this which basically give me no excuse but to incorporate more than toys into that socialization play time. Way back I had parents dab their baby’s hands and feet onto jumbo washable stamp pads and make prints on postcards, but then I didn’t keep up with doing these kinds of things. Time to change! 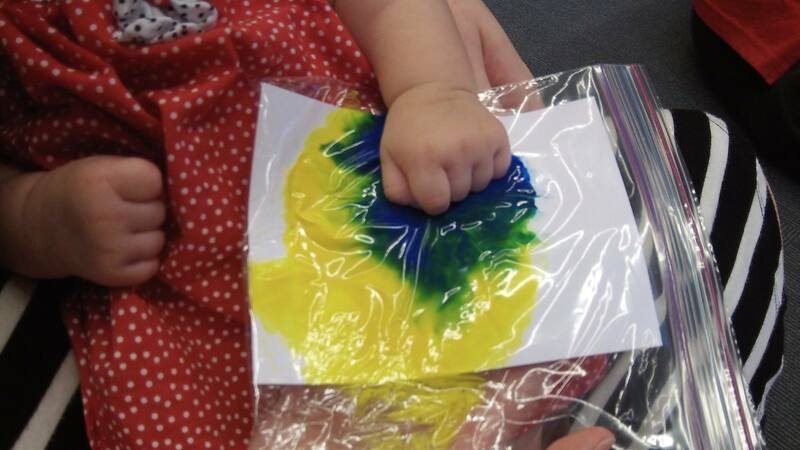 First up, I handed out ziploc baggies with a piece of cardstock and a few squirts of washable tempura paint (just in case the bags leaked) and let them squish and feel and explore the bag. Then, parents could take the art home to let it dry and display. Got this idea from Brooke. This gal was only 3 months old and didn’t do a lot with it but was definitely interested. Next was baby eyebrows. Pure awesome. This week was sensory hoops. Super easy to make and a lot of bang for the buck. 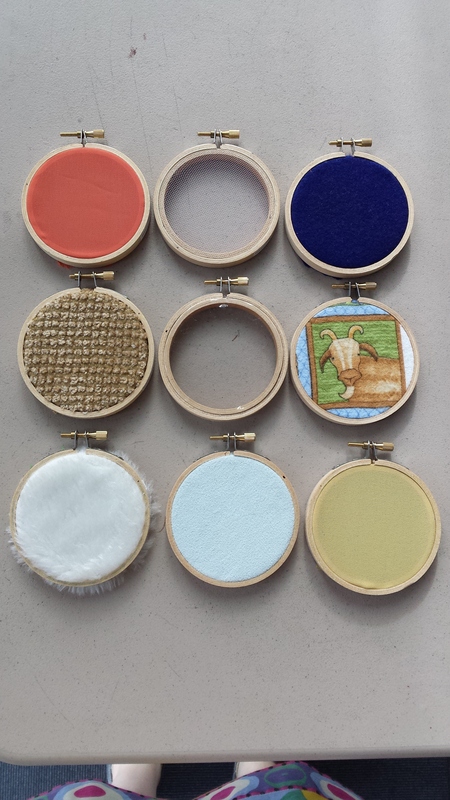 We already had these small embroidery hoops leftover from a screenprinting program and I just found fabric scraps in our craft closet and in my own sewing materials. Materials included felt, tulle, flannel, suede, plastic, faux fur and sheer fabrics. I set them around on the floor with the toys and told parents what they were. They all couldn’t wait to make them at home and had lots of questions. Meanwhile, their babies were going crazy feeling, mouthing, staring, and generally enjoying these new round objects in their environment. That’s a great tip, Kelly! And, do it! Those who don’t want to won’t and the rest will have a blast. What an awesome idea! Thanks for sharing. We tried this at our library too, and it was so much fun! I’ve written a post about our experience with “Baby Art in a Bag” on my blog, http://storytimesteph.com/ .